Daryl Johnson (Worcester Park, United Kingdom) on 30 July 2010 in Architecture. 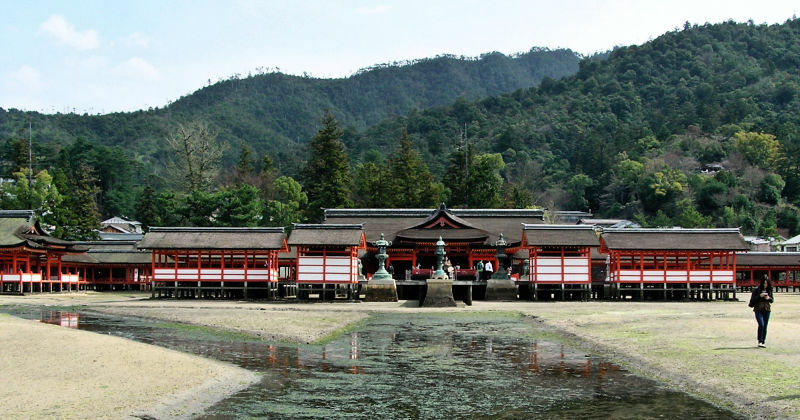 This is Itsukushima shrine as viewed from back out toward where the torii gate is (at low tide. Obviously). This is wonderful! What a view! The green background, the red shaping out the structure, the Y carpet leading to the buildings AND the girl with the cellphone......new and old, tradition versus trendy....what a complex composition! And....I love it! A really great view indeed of this beautiful place. I like having the lady in the frame. one an other nice place in Japan!! a great shot!! great framing on this wonderfull shot.grat colors!! So adore the blending of built structure with the landscape - such harmony.